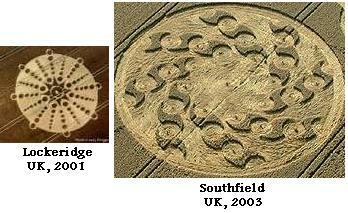 The incidence of 6 or more arms, seen in so many crop circles over the years, all with a central point indicating, obviously, the Sun, is an unmistakable clue that there is a pattern to the orbits around the Sun, guided, nudged, sorted out and placed, by something emitted from the Sun. In this particular new Arkansas circle, the counterclockwise motion created by these emanations is likewise clear. Where the Sweeping Arms of the Sun were shown with a pattern of 8 per year, the emanation that controls the orbit distance from the Sun is paced with 6 or more sweeps per year of another kind of emanation from within the Sun itself. 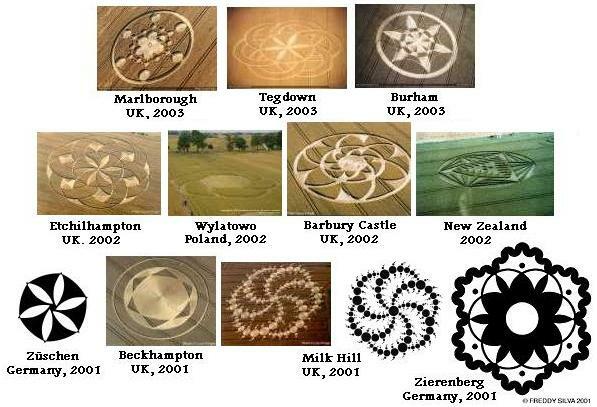 These crop circles with diagrams of 6 or more always have an outer edge, indicating they are not infinite. Thus a planet halted in its orbit, as Earth is, finds itself reminded of this distance more often than when traveling ahead of this particle flow sweep. This reinforced reminder comes at a time when Earth is frantically trying to escape the magnetic grip of Planet X, but, as we have stated, it cannot. Why do the planets select an orbit ring, and stay in it? Venus and Earth are the same size, but Venus rides closer, Earth further out. By what rule do they stay in their lane, even when seldom close to each other, and almost always apart by large spans of space? Each planet stays at the outer edge of a particle flow emitted from the Sun, that outer edge where that planet is comfortable, the flow not creating a crowded particle flow for that planet as an independent system. Since we have stated that Earth once rode an orbit within the Asteroid Belt, and after collisions with Moons trailing Planet X during one of its many passages arrived at its new orbit, this might seem a contradiction, but the mass and composition of Earth changed at that time. It lost much of its core material, exploded into space as magma, the stuff asteroids are composed of. It lost the majority of its water, spewed likewise into space, the stuff comets are composed of. 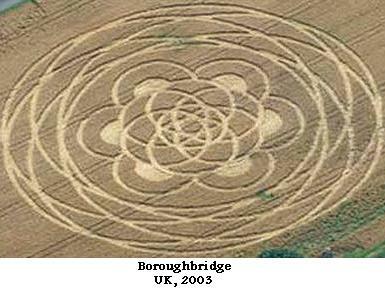 This crop circle is reminding mankind that Earth cannot escape Planet X by leaving its orbit. It cannot leave as gravity is pulling it into the Sun. There is more than the Repulsion Force, the outward flow of gravity particles, keeping the Earth at the distance it steadfastly maintains. There are hundreds of such particle flows, almost all unknown to mankind, controlling orbits. Earth is positioned at the distance from the Sun she is, as at this point the crowding of this particle within her system as an independent center is not creating a bumping outward away from the Sun. Earth has come as close to the Sun as she can, and there is locked in her rut, her orbit. As the Dark Twin likewise cannot leave his orbit, and has come up behind Earth creating havoc if the Earth attempts to back up away from the oncoming Planet X, this lock into orbits is doubly significant. Cant move back. Cant move in. Cant move out. Cant move forward, as there stands the monster Planet X!